Immerse yourself in the pleasures of a modernized bathroom that’s filled with all your favorite creature comforts. Update your old bathroom with the all latest colors, textures, and fixtures in a perfectly executed custom makeover you can count on to dramatically increase your everyday comfort while adding to the appeal and resale value of your home. Get an inside look at bathrooms of the rich & famous. 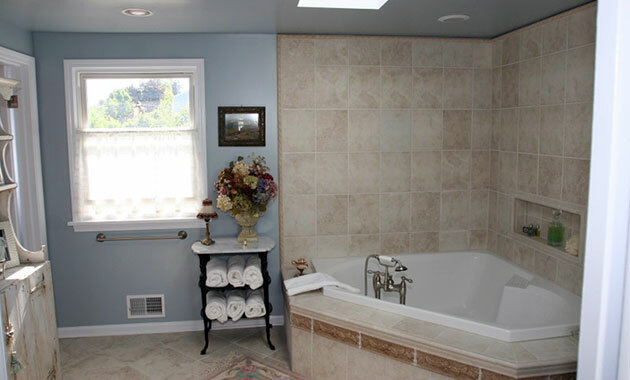 You'll find plenty of inspirational bath designs on Home Portfolio, HGTV, and Houzz. Get Industrial – On the downswing of the spa bathroom trend of recent years, today's bathroom designs are leaning more towards modern and industrial. Think finished metal, vessel sinks and integrated double sink tops, which have a warmer, more classic feel. Radiant Heat – Ceramic tile has long been the top durability and aesthetics choice for bathroom floors, but today's consumers are loving the surprisingly energy efficient radiant heat option for underneath this classic. No more cold feet! Ceiling Height Mirrors – Frame a ceiling height mirror with crown molding above the vanity and you'll instantly add perceived size and elegance to your bathroom. This is one inexpensive, hot trend that people are loving right now.